Cruise (or resort) collections are summer wardrobes available in stores during the winter months, originally designed for customers preparing for a sunny escapade to escape the cold. Today, they offer opportunities for Louis Vuitton and Christian Dior to show their creations in striking settings, as well as a chance for the designers of the houses to explore inspirations beyond their habitual realms. 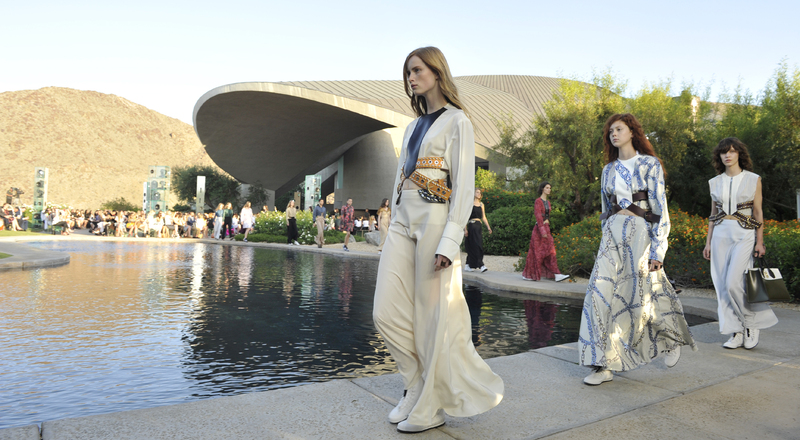 For Louis Vuitton, Nicolas Ghesquière dove into California culture of the 70s, an era when a hippie community spirit met Hollywood glamour, counterbalanced by a fascination with more somber news headlines. He sent out long and ample silhouettes in black leather alongside mini ensembles in pop colors. The looks were set against the dreamlike decor of the Bob and Dolores Hope home, a concrete cupola perched above the desert in Palm Springs. Entitled “Thanks for the Memories”, the collection in a tribute to the wild side of American counterculture. Palais Bulle, set on the cliffs of Théoule-sur-Mer next to Cannes, welcomed the Christian Dior show. Raf Simons sees the spherical building as a perfect symbol of insouciance, lightness and youth, informing the fluidity of his creations. Cotton, fine wools and lurex combined to construct silhouettes and clothes that seemed to float, while Southern France inspired embroidery featured the colors that have enthralled artists over the ages. Green, prune and orange recreated the hues of nightfall on a jacket with elongated checks, and a granite blue dress evoked the Mediterranean surf on a summer day.